An advertisement in The Thomasville Times-Enterprise, December 23, 1919, Thomasville, GA says something interesting about life in this region in the early 1900s. Live Possums Wanted. The Thomasville Times-Enterprise, December 23, 1919. 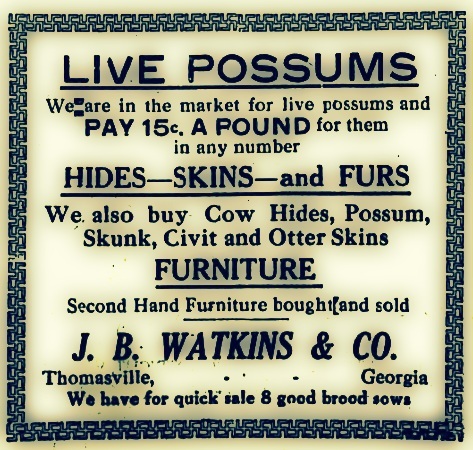 According to numerous South Georgia newspaper accounts, possum hunting was very popular in the early 1900s, and possum was considered excellent fare for special occasions, entertaining guests, or even Christmas dinner. In December of 1913, a “Possum Supper” was put on by the Mashburn Drug Company of Valdosta, for local doctors and drug company representatives. One attendee of the special event was Dr. A. L. Johnston of Valdosta, who also provided services for Ray City residents. South Georgia possum was a feast for presidents. Valdosta Times, January 16, 1909. From History of Worth county, Georgia: for the first eighty years, 1854-1934 comes the following information on what was perhaps the greatest possum dinner of all time. 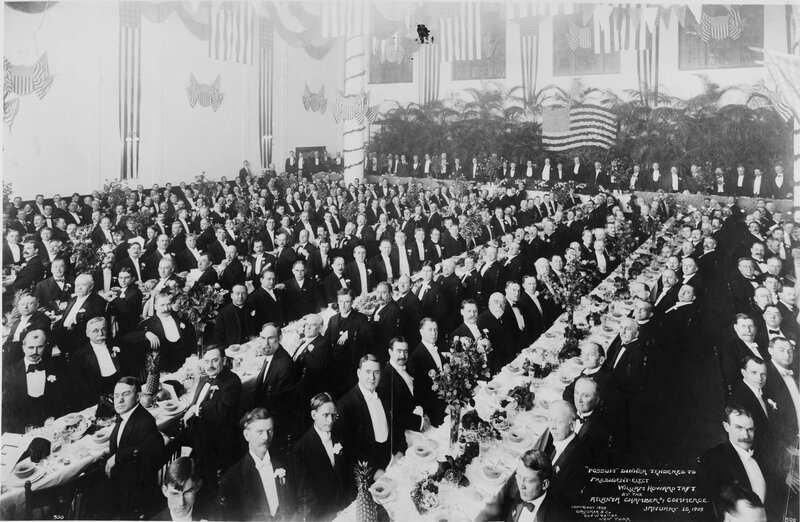 The County of Worth has volunteered-nay, has asked the honor-of furnishing, free of charge, the one hundred fat ‘possums necessary for the great supper to be given President-elect Taft on the occasion of his visit to Atlanta, the aforementioned animals to be served in accordance with the expressed wish of his Honor. “Sylvester, Ga., Jan. 2nd, 1909.-E. C. Caverly and Mr. Wilkerson, ‘Possum Committee, Atlanta: Worth County asks the honor of being allowed to furnish free to the ‘possum and ‘tater supper, the one hundred fat ‘possums required. Answer promptly, so we can unloose the ‘possum dogs. “Frank Park, Sylvester, Ga.: We accept with pleasure and gratitude your offer to furnish ‘possum and ‘taters. Unleash your discriminating ‘possum dogs. ‘taters, ‘possums, and simmon beer. “The deed is done! The suspense is over! The slaughter of the innocents is accomplished! The largest and most varied collection of ‘possums ever accumulated in the ‘possum state of the South, went to their fate Wednesday morning, not exactly like lambs led to the slaughter, because they were ‘possums ; and a ‘possum is not like anything else under the sun, except another ‘possum. Neither is there any other creature whose execution is along such utterly original and outlandish lines. “No stately guillotine towers above the prospective victim-no dangling noose awaits his cringing neck-just a broom-stick and a colored gen’man. “How the deed was done. The ‘possum, grasped firmly by his rat-like tail, is flopped with some enthusiasm, upon the ground chin down. Across the nape of his neck, is placed a broom-stick, upon either end of which the executioner places a number 11 foot (the number is important). Without delay (for the ‘possum does not take kindly to this procedure) the southern extremity of the animal is smartly elevated by means of that convenient handle, his tail, and-“snick !” It is all over. Another ‘possum has been gathered to his fathers in the great beyond, where perennial persimmon trees flourish, and there is no happy hunting ground. “Such is the manner of his taking off by Levi Colbert, imported for the purpose from Worth County and retained at the Piedmont, as consulting cook, to assist in the post mortem preparation of a hundred ‘possums for the table of the great. With Levi came Annie Daniels and Mahala Bennett, all of them from the Worth County plantation of Judge Frank Park. 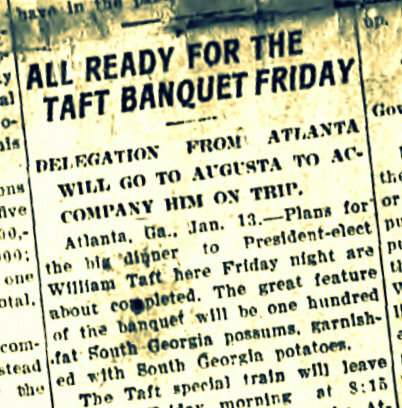 You can see more about Taft’s possum dinner at the Georgia On My Mind Blog . In addition to providing medical services, Dr. A.L. Johnston on at least one occasion performed a wedding ceremony. Valdosta, Ga., July 24. –(Special.) – a romance of 40 years culminated here last night in the marriage of Mrs. Sleeper of Buffalo, N.Y. to D.E. Wire of Rays Mill. The bride came from her home in the north by previous appointment to meet Mr. Wire here, and the marriage ceremony was performed by Dr. A.L. Johnstone, at the Residence of Mr. and Mrs. J.H. Murray. The couple were sweethearts when they were children, together nearly 40 years ago. 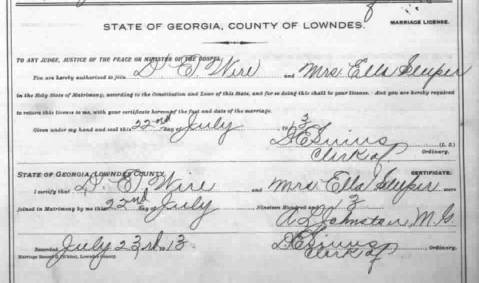 Marriage License for D. E. Wire and Mrs. Ella Sleeper, July 23, 1913. The February, 1914 issue of the Pharmaceutical Era reports on the “Possum Supper” thrown by the Mashburn Drug Company of Valdosta in December of 1913. Aside from the interesting menu, the affair was also noteworthy for the presentation of “moving picture films” and “stereopticon views”, and “automobile rides” around the city. One of the attendees was Dr. A. L. Johnston of Valdosta. Dr. Johnston had a Ray City, GA connection and provided services, sometimes unusual, for Ray City residents. More on that in the next post DAN CUPID WINS OUT AFTER FOURTY YEARS. The Mashburn Drug Company, of Valdosta, Ga, gave their second annual ‘Possum Supper to their customers in December. Quite a number of their guests who reached Valdosta in the early afternoon were given an automobile ride around the city. At 8: 30 p.m. the guests were escorted to the New Valdes Hotel, where a sumptuous repast was spread, consisting of ” ‘possum and taters,” birds, salads, etc. A. E. Dimmock, a Valdosta druggist, was toastmaster. Among those responding with toasts were Mayor Jno. T. Roberts, of Valdosta; Jno. Dickerson, of Jacksonville, who represents Eli Lilly & Co. in the State of Florida; C. L. Parks, representing H. K. Mulford & Co., Philadelphia, Pa.; Dr. E. P. Quillian, Clyattsville, Ga.; Dr. J. M. Hall, Douglass, Ga.; W. A. Bradley, representing the Cleveland Fruit Juice Co., Cleveland, Ohio; Senator W. L. Converse; Fred Bergstrom, of Bergstrom & Newberry; Dr. A. L. Johnston, and Russell Peeples, of Valdosta, Ga. Woods A. Caperton, sales manager for Eli Lilly & Co., Indianapolis, Ind., was a specially invited guest and he made the trip to Valdosta to attend this supper. He brought with him about 80 stereopticon views and two reels of moving picture films and immediately after the supper he gave those in attendance a “moving-picture trip” through the plant of Eli Lilly & Co. About 150 or the Mashburn Drug Co.’s customers were present and all expressed themselves as having had a most enjoyable time. In The Pharmaceutical era, Vol 47. (1914). New York [etc. : D.O. Haynes & Co.